HE Janos Herman, Ambassador of the European Union to Georgia, has held a farewell meeting with the media on 16th of August, 2018. The Ambassador addressed the media with a short introduction about his mission in Georgia with an emphasis on essential achievements during these four years. “Relations between the European Union and Georgia in 2018 are not likely where it was in 2014. First, in 2014 we have signed the Association Agreement, and then in 2016, it entered into force. This is an agreement, which gives you a very raw base for our cooperation, it is an ambitious one, and I think, much of what we have done can be seen as the implementation of this Agreement by Georgia”, said the Ambassador. Ambassador of the European Union to Georgia was proud to say that one of the most significant successes of these years was visa liberalization, which allowed hundreds and thousands of Georgians to travel visa-free to the countries of Schengen zone. He also stressed the fact that it is a new phase for Georgia and many efforts have to be made for it to function correctly. Janos Herman, recalled the day, when the President of the European Commission, Jean-Claude Juncker, visited Georgia, to join the celebrations in Tbilisi to commemorate Georgia’s centenary Independence Day, 100 years of the First Republic of Georgia. As a consequence of this visit, the two sides decided to hold the annual meetings between the European Commission and Georgian Government. The Ambassador called out the numbers and proudly said, that there’s nobody that has given so much financial support to Georgia then the European Union and this support has increased substantially over these years. Herman made a summary of all the support mechanisms implemented during these years in Georgia. The EU has contributed to many fields, such as reforming public administration and justice sectors, agriculture and rural development, helping economic growth and market development, strengthening institutions and good governance, connectivity, energy efficiency, environment and climate change, developing Georgian infrastructure, renovating roads, highways, building hydroelectric stations and so on. The Ambassador feels proud of these last four years as the European Union became more active in the way of security. “It is an area that would become more and more important in our cooperation as EU is becoming a more security actor in the world and we have significant economic resources in 2018, which we have been discussing with Georgian Government lately. 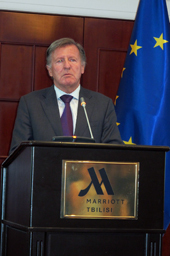 EU wants to be an important factor in strengthening Georgia’s security”, said Janos Herman. Herman strongly believes that the approximation towards European Standards in Georgia will continue. It’s a fact that not long ago Georgian Government adopted the roadmap to the EU, it’s also evident that the implementation of the Association Agreement will continue and it’s clear that the EU will continue providing important and significant financial assistance even in the future, which will lead towards modernizing and developing this country. He summed up his farewell speech with words of gratitude and appreciation towards everyone with whom he worked over these years, or whom he met. He conveyed his thanks to thousands of people, press, Government, Parliament, political parties, opposition, business, NGO’s and expressed how honored he is of the spiritual support he had from the Catholics Patriarch of Georgia Ilia II. “It was an honor to represent the European Union in such a country as Georgia,” ended Janos Herman.